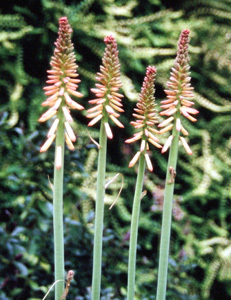 Joy Creek Photo Archive (c) all rights reserved The narrow, green, deciduous leaves or Kniphofia 'Maid of Orleans' are only 15 inches long but the dramatic bloom spikes can reach 4 feet. The tubular yellow flowers fade to ivory as they age. Mid- to late summer. 4 ft. x 18 in.